Planned to take a photo from above the albatross with the beautiful blue ocean as a background, I waited patiently in an observation hut. Finally, I was so lucky to have this moment rewarded. 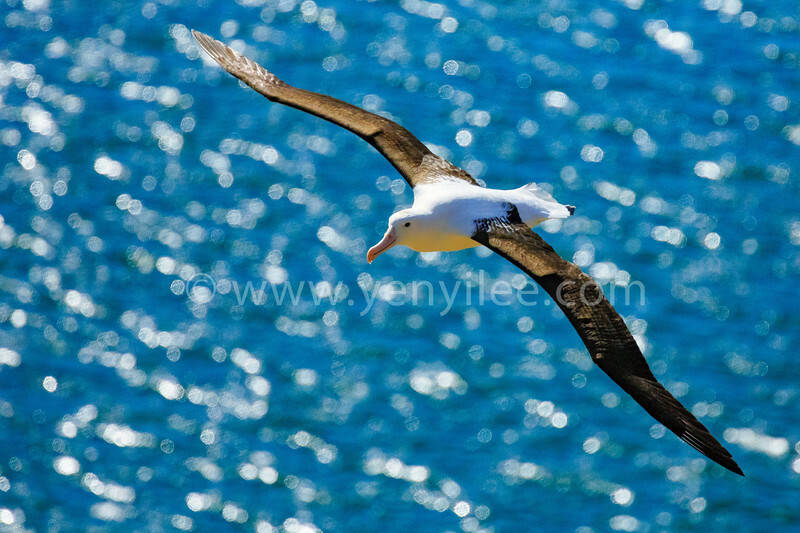 Northern royal albatrosses are listed as an endangered species by the IUCN. They have a breeding range of 8 km^2, where 6,500 to 7,000 pairs breed on the Chatham Islands annually along with 60 pairs at Taiaroa Head, for an estimated total of 20,000 birds. To help in the survival of this species, bird banding is underway. Taiaroa Head has predator control in effect during the breeding season, and there are no predators on the Chatham Islands. Enderby Island and Taiaroa Head are nature preserves, and the Department of Conservation had eradicated feral cattle, rabbits and mice from Enderby Island by 1993.